Mental Anguish - "Mile After Mile"
"We take the loops of sounds, music we create and turn them into some exciting new pieces of music. Sometimes I just use loops provided by the Germ Members and add fx and all to them. Sometimes I play live over them and sometimes (lots) I take the loops and mangle them up with a editor like Sound Forge or something, then throw them into Tuareg, an interactive phrase sampler (software), and further add sounds to the loops and mix them together with other sounds (loops) etc." There's a wild variety of freakiness across the CD's 16 tracks. Harsh techno rhythms, pile upon pile of bizarre sounds, oddball voice samples, space gurgles, and everything else you could never imagine. Techno and other off-kilter dance rhythms play a big role on many of the tracks though I can easily see ravers falling over themselves trying to keep a steady pace. This stuff thankfully shifts gear too much, refusing to settle into a single groove. I think it's the huge chaotic glom of sounds that are driven along by the rhythms that make the music so interesting. Sort of like the cartoon Tasmanian Devil who whirled around like a tornado babbling and spitting but still cut a decisive path. The "Benzola-Phinney Mix" track gave me the best idea of what Phinney is doing because Joseph Benzola is the one artist whose music is used that I'm really familiar with. While I can certainly make out the Benzola portions it's clear that Phinney is genuinely splitting the original into billions of atoms and reassembling it into a new mutated form with lots of extras. I can see why he thinks this is so much fun and if remix projects interest you then you likely will too. 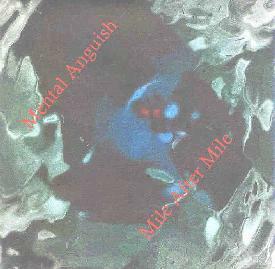 You can hear tracks from Mile After Mile plus various other releases at the Mental Anguish Mp3.com web site. If this fun with loops project interests you then check out the Tapegerm web site.